So, now we know approximately when to take our sights. But what is a 'sight', exactly? When we take a 'sight', what do we end up with? A sextant is a complicated-looking device designed to do something very simple: to measure the angle between two objects. It was invented during the great age of exploration and sail, and some of the great names of science worked on it's development, including Robert Hooke, Edmond Halley (of Halley's Comet), and Isaac Newton. I could write several blog posts on it's interesting history... but that would distract us from our Hello World! problem. And that is forbidden according to the rules! Suffice to say that the sextant evolved out of a long line of navigation instruments. It's immediate ancestor, the octant, was one of the first reflecting instruments. Reflecting instruments are so called because they used mirrors to make it easier to take measurements than earlier instruments. Briefly, the mirrors allow a user to view two objects at the same time. That was the key innovation. The movable arm, called the index arm or bar, enables the user to align the two objects in the viewer. When the two objects are aligned, the angle between them can be read directly off the instrument. This ease of use -- view two objects, align them in the viewer, read the angle -- forced the sextant's many competitors into extinction in just a few years. And it's never been improved upon. It was that brilliant an invention. Here's a short demo. Study how the mirrors work. By 'taking a sight', we mean measuring (in degrees) the height of the object above the horizon, at a specific moment in time. The exact time of the measurement is a critical part of the measurement, because the object (eg. the Sun) is moving and it's height is constantly changing. Not coincidentally, a high-quality sextant can measure to within 0.1' of arc. They could be manufactured to a higher degree of precision, but since celestial objects are moving roughly that far every second, added precision would not help, and might actually make it harder to use. So, that gives you a feel for the kind of numbers we are working with: very small, changing very rapidly. Finally, we have been talking about 'taking a sight', but most of the time, we will be taking several sights. A single sight is of limited usefulness. 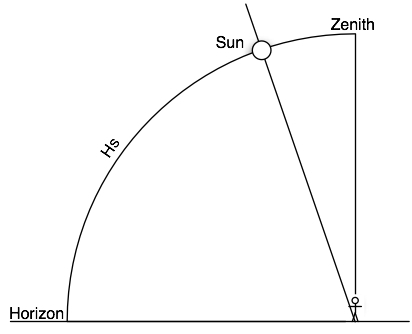 In particular, since we don't know the exact time of solar noon (if we did, we'd know our exact longitude, which is one of the things we are trying to determine), we are going to take not one sight, but a series of sights, starting at about 1/2 hr before estimated solar noon, and ending at about 1/2 hr after. But this series of sights and what to do with them is interesting enough to deserve it's own post, so I will leave that until next time. So have your graph paper ready! We'll be doing some plotting! Nice post, very practical and so much better than all that PKX triangle theory. I'm always happy to get a position within a couple of miles, close enough - and then switch on the GPS of course! !